Well, not for everyone, but for those who are at least a little disturbed by the disposable culture we now live in, it's a must read. Not as good "Shop Class as Soulcraft" though to be fair, the author isn't trying to write the same book so perhaps it's just different. Easier to read than Pirsig's "Zen" and definitely more to the point, it belongs on the same as shelf as these two books as well Richard Sennett, David Pye et al. This book is rich and dense in a good way, and stands up to repeated listenings. Korn weaves together his own life story, a history of the craft movement (the only part of the book where the momentum sags a bit), and a philosophy for living a meaningful and fulfilling life. If you're anyone trying to create something--whether writer, artist, musician, craftsperson, whatever--I haven't found a deeper guide to that journey anywhere. Inspiring! What made the experience of listening to Why We Make Things and Why It Matters the most enjoyable? The narrator has a pleasant voice and the author's story was both interesting and insightful. The truths about life that the story uncovers. What does Traber Burns bring to the story that you wouldn’t experience if you just read the book? No extreme reaction but I will listen to it again. Replace both instances of "we" in the title with "I" and you'll have a more accurate title for this book. I was genuinely interested in the history of the craft movement, but that information is buried beneath an uninteresting personal narrative and mountains of insufferable naval-gazing. I found myself engaged one minute, then disengaged the next as the author unpredictably meandered between personal anecdotes and grand philosophical extrapolations of his trade. I read all the way through, hoping to arrive at some sort of redeeming takeaway. instead I'm left with a headache. 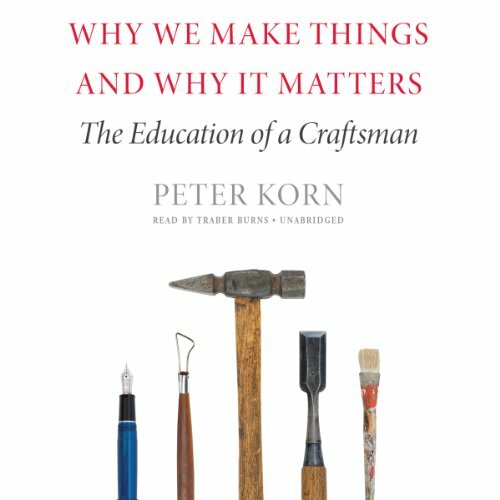 Master craftsman Peter Korn has lived self-determined, intentional life in which he has found value and meaning, and hopes to share his lessons with others. WWMT is at times inspiring with moving epiphanies and candid life stories, and at other times dry with the mechanics of his life and decisions. Overall, the book is easily worth the credit. Korn describes his two epiphanies: turning ideas into objects, and the creation of objects actually being a projection of the self he was trying to create. I actually found some of his other experiences to be enlightening: the joy he felt with the absence of want after his first bout with cancer, the difference between happiness and contentment, the importance of other people and their ideas, and the like. His narrative on the creative process changing your mental maps and yourself is interesting as well. I think Korn is fair with his self-criticisms, and overall a very self-reflective individual. He clearly cares about his work, be it a dining room table, woodworking school or a published book. In the end, its caring about your work that matters. Traber Burns is a perfect fit for this title. There should be a radio station that streams his reading of inspirational words ("integrity," "quality," "craftsmanship," etc.) 24 hours a day. Well done. I'm glad I discovered this book and was able to read about Korn's journey of self discovery. As a creative professional, I have drawn lessons from his writing. I also live on Nantucket and can better understand the environment in which his views were forged perhaps better than the average reader. Mr Korn chronicles his woodworking career in biographical form while asserting the value of artistic creation & finishing the timetable with the altruistic generation of a non-profit school for furniture makers. As a dabbling woodworker myself, I enjoyed this effort of explanation of why we make things, it seemed a bit narrow in scope, solely biographical, and thus less rewarding for me, because the term "things" encompasses a much greater genre than handicraft. Perhaps I would've enjoyed it far more if the reference photos could be included as a .pdf file to the audiobook. It would have annoyed me less if the "We" in the title was changed to the "I" that it should have been. Then I wouldn't have touched it with a bargepole. I make things and am going to flatter myself that this gives me at least the right to hold an opinion. One of the advantages that I have discovered of making things is that it brings me more into contact with other people who make things and , my experience is, that we all do it for different reasons. This guy appears to do it because it lets him adopt a superior view of his own importance. I do it because it lets me avoid having to deal with people who adopt a superior view of their own importance. And because I can spend all day listening to audiobooks. For every maker out there, there is a mix of reasons for the choice. This book, despite the "we" of the title, is interest in just one of them. And it is one of the less interesting ones. The story is a descent memoir of a self-taught carpenter / furniture maker; however, it did not extend beyond the author's journey and opinions. It felt a bit like listening to the story of an interesting stranger at a bar. I enjoyed it for a bit, but stopped listening about half way through because I didn't feel like there was any particularly profound insight. My first speed read escape! Promises much, is read well, but comes off as an afternoon spent with a bombastic professor.